All about fishing for smallmouth and largemouth bass in Minnesota lakes. Bass are one of the most sought after of all the game fish. Its appeal spans cultures, age groups and genders to tap on the heart strings of anglers everywhere. 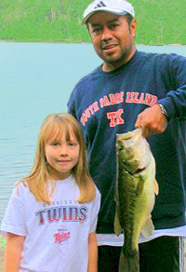 Join us in our endeavor to offer information about bass fishing on your favorite bass lake in Minnesota. Understanding the primary seasonal movements of smallmouth bass and largemouth bass is key to locating them on local lakes in the North Star State. If you like to fish for bass, especially smallmouth bass, Minnesota is your kind of place. Thousands of lakes and the vast majority have healthy populations of bass. This nice bass was caught at Thunder Lake out of Remer, Minnesota by Paul Martinez. Bigger lakes including Big Stone Lake, Cass Lake, Kabetogama Lake, Lac Qui Parle Lake, Lake Bemidji, Lake Mille Lacs, Lake Minnetonka, Lake Minnewaska, Lake of the Woods, Lake Pepin, Lake Traverse, Lake Vermilion, Lake Winnibigoshish, Leech Lake, Lower Red Lake, Otter Tail Lake, Pelican Lake, Rainy Lake and Upper Red Lake all contain bass. The Minnesota state record largemouth bass was caught from Tetonka Lake and the state record smallmouth bass came from West Battle Lake. The more you know about the seasonal migration of bass, the more likely you are to be looking in the right area next time you visit Minnesota bass fishing lakes. Visit the bass fishing page for more in-depth information about bass activities. Best bass fishing lakes in Minnesota!